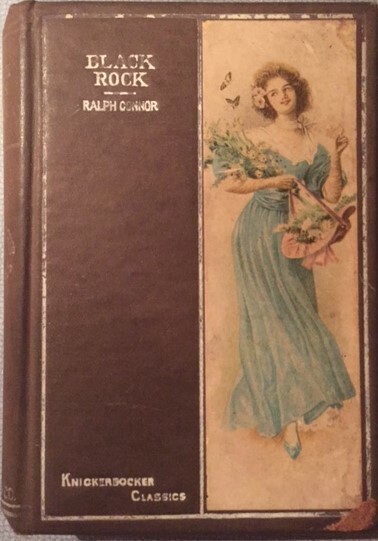 Undoubtedly this was not a best seller, but it sold well enough to have, I deduce, at least three editions -- at any rate, the copyright page says 1916 and 1922, and my edition is from 1926. 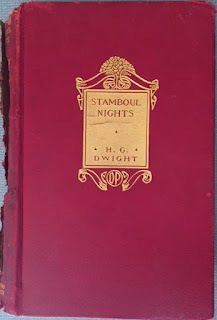 There is an introduction by John Macy, presumably written for the second edition, that rather gushes about the book and the author, declaring "Stamboul Nights is on the way to becoming a classic." But I don't think that has happened -- indeed the book seems close to forgotten. Dwight was, however, very well reviewed in his time, and considered a fairly significant writer of short fiction. One reason for his diminished reputation may be that Dwight wasn't terribly prolific: he wrote one more collection of apparently quite similar stories, a couple of travel books, on Constantinople (i.e. Stamboul) and Persia. And some books on art: Dwight became assistant director of the Frick collection later in his life. Harrison Griswold Dwight was born in Constantinople in 1875. He was educated in Turkey, and went to college in the U. S. (Amherst), then became a diplomat, serving for example at the peace conferences following the first World War. His stories appeared in the major magazine of the early 20th Century, and indeed I found a couple of letters from Willa Cather in which she seems ready to buy a couple of his stories for McClure's (where she was editor), and asking for revisions. In the end only one of the stories in this book appeared first in McClure’s ("Mill Valley", called "The Valley of the Mills" in Cather’s letters: apparently her request to "sharpen the point" of "Mortmain" was either ignored or not done to her satisfaction) -- others appeared in the Atlantic, Scribner’s, Appleton’s, the English Review, Harper’s, and Putnam’s (with one original to this book) -- all fairly prominent magazines of the day. Dwight’s introduction does say that each story has been revised for the book publication. The stories are all set in and around Constantinople, presumably late in the 19th Century or early in the 20th. They are all told by a mostly uninvolved narrator, an obvious stand in for the author. The stories are told in a leisurely manner, with a hint of a sly smile often peeking out behind the narrator’s mask. His attitude towards the Turks and Arabs and Armenians he depicts is sympathetic and broadly approving -- that said, though born and raised in Constantinople, Dwight was a Westerner, so his slant must be viewed as that of an outsider. I suppose it’s possible that a certain flavor of Orientalism has contributed to the book’s current obscurity. To briefly describe each piece: "The Leopard of the Sea" is an amusing tale of the troubled journey to Yemen of an old steamship called Leopard of the Sea, framed as the narrator’s encounter with a local man while he tries to set up for a photograph. "Mortmain" is about an American missionary building a chapel, the grounds of which are said to contain a treasure of the Armenian church, buried since 1453: an Armenian man wants the missionary to at least split the proceeds with him. "Mehmish" is about an old man, a faithful doorkeeper, looking for a new position after getting out of prison for manslaughter. "The Glass House" is about the history of a strange house formerly owned by a rich patisserie proprietor and his wife. "The House of the Giraffe" is about a truly nasty Pasha, who finally meets his deserved fate when a governmental change is forced. "The Golden Javelin" is about the narrator’s pretty cousin, who surprised her family be marrying an older man, a missionary, and her sad fate and the title objet d’art. "His Beatitude" is a rather funny caper story, about an old man who is suddenly recruited as the next Patriarch of the Armenian church in Constantinople -- for unexpected reasons. "The Place of Martyrs" is about the doomed affair of an Orthodox boy with an Armenian girl. "Under the Arch" is another story of thwarted young love, this time by a young Anatolian for a prostitute. "For the Faith" is about a missionary and his involvement with a North African man who offers to sell bibles for him -- and what the man was really doing. "Mill Valley" concerns the narrator’s visit to a country village, and a night of drinking, and the shocking result. "The Regicide" is the least Stamboulian story: the narrator meets an American couple on an ocean liner, and hears their story of their time as diplomats in Basra, and of the wife’s clumsy attempts at promoting morality among the locals. "The River of the Moon" is about an old gun, and a very valuable necklace, and the narrator’s unfortunate mixing up with a criminal act. Finally, "In the Pasha’s Garden" tells of an old Pasha, and his younger French wife, and a conversation they have while the Pasha suspects (or does not?) that she has hidden a lover in the room before he came by. My favorites, I think, are "In the Pasha's Garden", "The Golden Javelin", "The Leopard of the Sea", and perhaps "The House of the Giraffe". All these stories, as I suggest, have a bit of humor behind them -- rather fatalistic, though. They are quite nicely written in a distinctly early 20th Century style. It's noticeable that most of the pieces depict sad, sometimes tragic, often criminal, events, but with very light touch. I enjoyed the book -- Dwight was a fine writer, if in the final analysis not quite prolific enough, perhaps not serious enough, to compel significant latter day attention. Mary Ann and I have just got back from Kansas City where we attended MidAmericon II, the 2016 World Science Fiction Convention. Last year I published a fairly long look at our trip to Spokane for Sasquan, the 2015 Worldcon. I'm not sure I'll write something as long this year, but if I do it will take a little time. So, a quick look: first, I really enjoyed myself. I always do, really. The best part is conversations, meeting people I haven't yet met and seeing old friends. Any list I make will leave out important people, but off the top of my head, I was able to meet Jonathan Strahan in person for the first time, and we had several excellent talks. I also met Kate Baker, Ken Schreyer, Marty Massoglia, Bo Bolander, Andy Dudak, Jason Sanford, Sarah Frost, James Cambias, Heather Shaw, Sunil Patel, Carrie Vaughn, Daryl Gregory, Caroline Yoachim, Steve Pantazis, Martin Shoemaker, Ron Yaniv, Rosemary Kirstein, Jacob Weisberg, Gord Sellar, Rich Larsen, Christopher Kastensmidt, and Jonathan Eller. And of course I saw a lot of folks I've met before: John O'Neill, Ellen Datlow, Gordon Van Gelder, Charlie Finlay, Sean Wallace, Neil Clarke, Liza Groen Trombi, Kij Johnson, Christopher McKitterick, Gary Wolfe, Sheila Williams, Bryan Thomas Schmidt, Ann Leckie, Gregory Benford, Michelle Sagara West, Teresa Nielsen Hayden, John Joseph Adams, Mark Olson, Jo Walton, Joe Karpierz, Charlie Jane Anders, Steven Silver, Lynne Thomas, Michael Damian Thomas, Jeremy Tolbert, E. Lily Yu, Adam-Troy Castro, Judy Castro, Travis Creason, Francesca Myman, Andrew Porter ... I know I'm shamefully forgetting a lot of people! But that's what's really great about Worldcon. Hugos? The regular Hugos went pretty much exactly as I expected. I guess I didn't have a good idea what would win the Novel -- I've only read Ancillary Mercy so far, and I enjoyed it -- but by all accounts (including Ann Leckie's) the actual winner, N. K. Jemisin's The Fifth Season, is wonderful, and it's certainly on my To Read list. The novella winner, Nnedi Okorafor's "Binti", was the one I expected. It wasn't my personal choice, but it's a worthy winner. I do still wish, of course, that great stories by Greg Egan, C. S. E. Cooney, and Carter Scholz had made the short list, but alas it was not to be. I would have been thrilled with either of the two plausible novelette winners: Brooke Bolander's "And You Shall Know Her by the Trail of Dead" or the actual winner, Hao Jingfang's "Folding Beijing". Those were really a tossup to me -- so no complaints here! And the only worthy story on the short story ballot won, Naomi Kritzer's "Cat Pictures, Please". I won't discuss the rest of the ballot, except to say that in general the winners were good choices, to the extent I was familiar with them. The Retro-Hugos? Again, predictable. Novel went to Slan -- perhaps not the best novel of 1940, but a good bet for the one that would have actually won! Novella and novelette went to Heinlein stories ("If This Goes On" and "The Roads Must Roll"). Reasonable choices, I guess. The disaster category was Short Story, where Isaac Asimov's "Robbie" -- which technically should have been called "Strange Playfellow"! -- took the award. It's just not a very good story, and it only won because it was the first of his robot stories. Also possibly the least! The best story on the shortlist, by about 20 parsecs, was Jorge Luis Borges' "Tlon, Uqbar, Orbis Tertius", one of the greatest of 20th Century stories. If you want to argue that no voter in 1941 would have read the Borges story, which had at that time appeared only in Spanish, and as far as I know, only in Argentina, well, fine. Very few voters in 1941 would have picked "Strange Playfellow" (none would have picked "Robbie", because it didn't have that title yet) -- and no one would likely have realized it would be famous as the first of a famous series. The better choice if that was your algorithm was Heinlein's "Requiem". Ah well, that's just to repeat the obvious: the Retro Hugos really truly do not work. Programming? I had three panels myself. The best, I thought, was the last, Transcending the Genre, a Sunday panel, with Rosemary Kirstein, Teresa Nielsen Hayden, Tom Easton, and Jennie Goloboy. We essentially discussed the increasing acceptance of SF (and some SF writers) in the literary world. Which is a shallow way to put it. I think we handled it pretty well, covering attitudes on both sides of the fence, marketing, history, the reasons there might be differences, etc. One other panel concerned the Small Press, which also featured Jason Sizemore of Apex; Ron Yaniv, an Israeli editor/publisher (and his insights on the market in Israel were very interesting); Katherine Wynter, and Jamie Lackey. And the third panel was Reviewing the Reviewers, with Michelle West and Gary Wolfe. Alas, Alvaro Zinos-Amaro was not able to be there due to a detached retina -- get better quickly, Alvaro. I really missed the chance to talk to Alvaro again. Michelle and Gary and I have done pretty much this exact panel before, and I think we covered it well, but, yes, it was familiar stuff. Other programming? I attended a lot of panels. To the point that I got panel fatigue at points. I also did a few Kaffeeklatsches and Literary Beers. I find these very fun. I did them with Jo Walton, Kij Johnson, Gary Wolfe, and Jim Cambias. Good discussions every time. Controversy? Well, yes. I was at the notorious "State of Short Fiction" panel, moderated (immoderated?) by Dave Truesdale. Dave is an old friend, and I owe him a lot, for bringing me into the fanzine field by letting me review for Tangent (the print version!) back in the '90s. But Dave really went off the rails on this one. Leaving aside the substance of what Dave said -- which can certainly be disputed -- his presentation was deliberately offensive, and that's a problem in itself. And obviously counterproductive. From my selfish point of view, the worse offense was that Dave hijacked a panel that I thought would be very interesting, and turned it into an argument/discussion about his particular current hobbyhorse. We heard essentially nothing about the state of short fiction today. We did have some discussion -- and Sheila Williams and Jonathan Strahan in particular (with good contributions from Gordon van Gelder and Neil Clarke) did try to address the substance of Dave's complaints. As for Dave's expulsion from the convention, I have no direct knowledge of the circumstances. But I have been told -- at second hand -- that there were issues beyond just the reading of the manifesto at the panel. If that was all that happened, it could have -- should have -- been dealt with in a less extreme manner than a ban. But we don't know what else was involved, and I think everyone should withhold further comment not knowing any background. Business Meeting? Mary Ann attended the bulk of the four day session. I attended what I could, given my other responsibilities. The basic results: the YA "not-a-Hugo" and the Best Series Hugo were approved (subject to ratification at next year's Worldcon). The 5% rule was eliminated, thank God! EPH was passed. My opinion on EPH has changed. I somewhat unconvincedly voted for it last year. But this year, after seeing analysis based on the last few years of nominating data (and eventually on this year's data (thanks to Dave McCarty for absolutely yeoman all-nighter work crunching the numbers!)) that showed that a) EPH has a rather small positive effect on the final ballots (not zero, but small); and b) it seems to actually potentially enhance small-scale slate voting (i.e., perhaps, a single author trying to get his friends to nominate him); combined with the fairly opaque nature of the algorithm; and a fourth effect, perhaps a selfish one: EPH tends to reduce the power of nominators -- like me, yes, I admit -- who actually read a substantial portion of the works eligible in a given year (in some categories). I frankly don't think that the vote of a person who has read just a few things and liked two of them should be privileged over someone (let's call him Rich H for short) who might have read a couple thousand stories and liked five. But even aside that admittedly selfish whine, I think the other problems with EPH mean it's a bad idea. 4/6 also passed, modifed to 5/6. Why not 5/8? Or 5/10? But that's water under the bridge. 5/6 is an improvement, but a very small one. I'm headed to Kansas City for the World Science Fiction Convention tomorrow, so I'll make an early post this week, and make it an SF post. Here's an Ace Double featuring a major writer, with perhaps his weakest novel, and a very minor writer, with his only SF novel. I wrote this back in 2004 or so. This early Ace Double features one of only a couple Isaac Asimov appearances in the format. The Rebellious Stars is better known as Tyrann, under which title it appeared as a Galaxy serial in 1951. 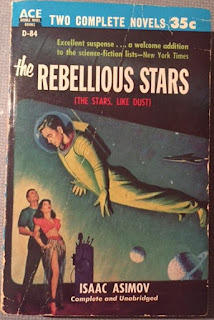 (OK, it's even BETTER known as The Stars, Like Dust, Asimov's preferred title and the title of the original 1951 Doubleday hardcover (and of all English-language editions since then, as far as I know, saving only this Ace Double).) In this edition it is about 67,000 words long, and the book is labeled "Complete and Unabridged", so as far as I know it's the same as the standard edition. 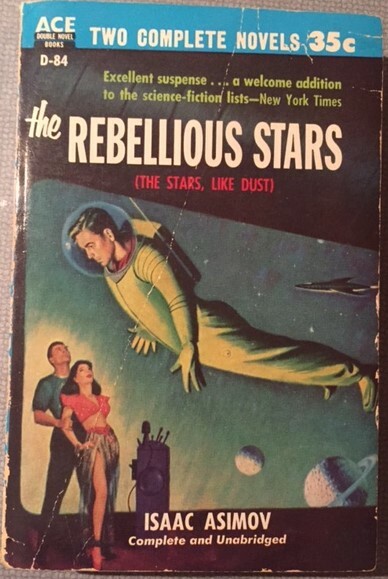 The title change is typical of Don Wollheim's habits, though to be fair The Rebellious Stars is a fairly appropriate title (arguably more appropriate, if less poetic, than The Stars, Like Dust). Also, the original book title is given in parentheses on the cover, so book buyers weren't likely to be fooled into getting a book they already owned. The other half, An Earth Gone Mad, by Roger Dee, first appeared as "The Star Dice" in Startling Stories, November 1952, but this edition, the first and only English language book edition, may possibly be expanded. (At any rate, the copyright date is 1954, while that of The Rebellious Stars remains 1951, implying that the Dee novel had been changed.) This novel is some 54,000 words long. 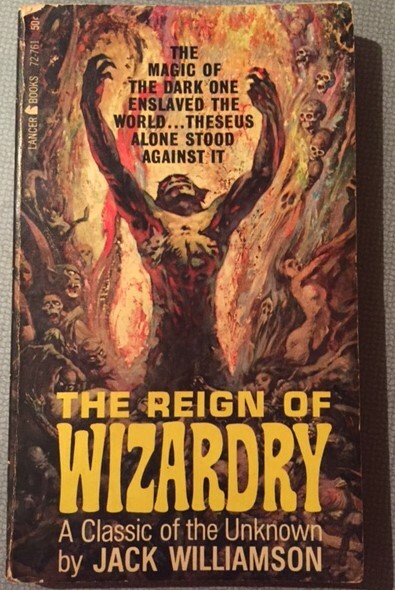 The cover artists are Ed Valigursky (for the Dee novel) and Harry Barton (for the Asimov novel). Isaac Asimov was probably the SF writer I came to earliest after knowing there was such a thing as SF, and the first SF writer I read widely. (Though Clarke cannot have been far behind.) So I read much of his work quite young. I was perhaps only 12 when I read The Stars, Like Dust. I've always remembered it, if only dimly, with pleasure. Thus I've tended to bristle just a bit when I read contemporary discussions of his novels, which usually list this book as the least of his earlier, adult-marketed, novels. But now, three decades later, I've finally reread this book for the first time, and I have to say the people who denigrate it are right! It's a weak novel, quite a disappointment, to my much older sensibilities. That said, it does have some of the Asimov flavor, and while it must rank quite low in his bibliography, it's still reasonably enjoyable to read. The story opens as Biron Farrill, the heir of the Rancher of Widemos on the planet Nephelos, is about to graduate from his university studies on Earth. He is wakened one night by a ticking which he soon determines is a bomb -- an assassination attempt. Soon Sander Jonti, a friend of his from the university reveals that his father has been arrested by the Tyranni, the harsh ruling class that controls some 50 planets near the Horsehead Nebula, including Nephelos. It seems Biron's father was involved in a resistance movement, and Jonti is as well. Jonti convinces Biron that his life is in immediate danger, and sends him to another world, Rhodia, in hopes that the Director of Rhodia, Hinrik, can intervene. But while Biron is in transit he is arrested. The Tyranni, however, arrange for him to meet with the Director anyway, apparently believing that the weak, nearly mad, Director will turn him over again, a politically advantageous action. However Biron manages to meet the Director's beautiful daughter, Artemisia, and his cousin, Gillbret, and the two of them arrange to escape with Biron -- it seems that have been waiting to do so but have needed help from someone who can pilot a spaceship, that knowledge being forbidden in the Tyranni-ruled worlds. Fortunately Biron learned spationavigation on Earth. And they are off again, on a convoluted chase, looking for aid at a world Gillbret once visited, then looking further for a mysterious "Rebellion World". The plot takes several twists from that point -- it is all rather intricately designed -- before reaching a somewhat surprising (though dare I say rather guessable) conclusion. I will say that I had a slightly longer list of absurdities to complain about while reading the book, but Asimov explained several of them away quite convincingly -- and I'll add that while the plot is perhaps overcomplicated, and depends quite a lot on people acting in extremely convoluted ways, it is worked out somewhat satisfactorily in the puzzle-unraveling sense. The story opens with Paul Shannon leaving Io after having been marooned there for 2 years. (Dee's Io is apparently possessed of a breathable atmosphere and human-edible plants and animals, albeit in a generally hostile environment.) With the help of an inscrutable rocklike alien, he has repaired his crashed spaceship, and he limps back to Earth. But once on Earth, he finds that strange changes have occurred. A growing proportion of the population seems hypnotized into serenity and passiveness by the influence of some strange cubes that dropped from space -- these are the Cubists. (I don't know if Dee intended a reference to the modern art movement.) The rest of the US seems split down the middle -- the corporate oriented "Syndicate" is pro-Cubist, more or less, because the Cubists make tractable workers, while the labor unions are opposed, because Cubists are taking the jobs of ordinary workers. The government tries to toe a middle line. Shannon's instincts are strongly anti-Cubist, especially after he encounters his fiancee, who has become a Cubist, and is horribly changed thereby. He becomes obsessed with finding a way to counteract the effects of the Cubes. But he also finds himself mysteriously pursued by several different agents -- people from the government, the unions, and the syndicate (including his Space Service employers). And he has been impersonated, with his stand in having delivered a rabid anti-Cube rant during a staged interview. Finally, he is picked up by a beautiful, fiery, young woman, Ruth Nugent, who takes him to another center of resistance to the Cubes -- this a group of scientists (including Ruth's physicist fiance) who have built a NAFAL spaceship with which they plan to flee to Procyon and set up a new colony free of the Cubes. They want Shannon's help -- but he is convinced that there way is cowardly, and that something must be done to free the Cubists from the baleful influence of the Cubes. The rest of the novel, then, consists of lots of running around, with Shannon encountering representatives of each of the main power centers, and also exploring (with Ruth) an installation, a Peace Center, home to many Cubists. Things seem stranger and stranger -- obviously some weird conspiracy is involved. Could Shannon's old friend Gil Lucas be involved? And why do people seem to be secretly almost herding Shannon? And why is Ruth Nugent both so infuriating and so attractive? Anyway, all leads to a somewhat twisty resolution, complete with some philosophizing about the proper order of society, the place of humans in the Galaxy, etc. etc. It ends up ironically a curious pairing to an Asimov novel, not because it much resembles The Rebellious Stars, but rather because some of the ideas considered resemble ideas from much later Asimov novels like Foundation's Edge and Foundation and Earth. All in all I don't think it a very good novel, but it's a tolerable fast-moving read, with at least a brushing against potentially interesting SFnal ideas. Not really recommend on the whole, but not without some redeeming value. 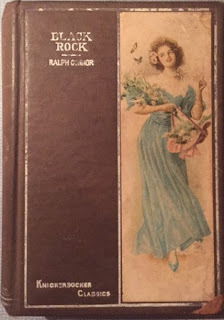 Ralph Connor was, according to the University of Winnipeg library, "the most popular and bestselling novelist of the early 20th Century". I assume by this they mean the most popular and bestselling Canadian novelist. Connor indeed enjoyed broad popularity, but his sales do not seem to have rivaled many American and British novelists. But he did sell very well, and one novel, The Doctor (1908), made Publishers' Weekly's list of the top selling novels of its year. So -- as you can see, this entry is not only a return to my major theme in this blog, "Old Bestseller", but also to one of the subsidiary themes: Canlit! Without really meaning to, I've covered a number of Canadian authors here: Coningsby Dawson, Robertson Davies, John Buchan, Frederick Niven, Michael G. Coney, and A. E. Van Vogt. I had hoped to cover more -- and I will, soon enough -- but it has been a while. And, on top of that, he was a significant writer. He began publishing short stories of the West in the 1890s, and Black Rock, his first novel, was published in 1898. The Sky Pilot, his first major success, followed in 1899. (Four years before Kitty Hawk, one supposes "Sky Pilot" didn't mean what we would think today.) He published a total of 30 novels, many on Western themes, some about the history of Upper Canada. My copy of the book is a a reprint, presumably from about 1908, quite small (octodecimo? (about 4"x6")), in the Knickerbocker Classics line from Hurst and Company. (Not to be confused with the contemporary Knickerbocker Classics that you see at Barnes and Noble, this was a series of inexpensive small reprints.) It is inscribed "Joe McG. Richerson, Dec. 20 1908" on the first leaf. Black Rock, as I noted, was Connor's first novel. It opens with the narrator, named "Ralph Connor", being persuaded by his old hometown friend and college mate Leslie Graeme come to the small mining town of Black Rock, in the Selkirk mountain range in British Columbia, for Christmas of 1882. Graeme runs a lumber camp outside of town. The town is almost all miners and loggers, with very few women, and with the main menace a bar/gambling den run by a man named Mike Slavin. We soon gather that the men, most of them roughnecks but basically decent, are in thrall to drink, and many of them, having promised to save their money to send to their families, or at least to set them up with a stake on returning home, routinely waste it all on alcohol or lose it to gamblers. The main bulwark against this is the minister, Mr. Craig, but he seems to be fighting a losing battle. Much of the novel is concerned with his attempts to form -- and make stick -- a temperance society. To this end he has one key aid -- the beautiful widow Mrs. Mavor, whose husband was a dissipated man of a good English family, sent to Canada to straighten out. Alas, just as he, after the birth of a child, had seemed to conquer his demons, he was killed in a mining accident. Mrs. Mavor has been in despair since then, living only for her child. But Mr. Craig convinces her to join his crusade, and also to resume singing for the men -- one of the few things that inspire them like drink. And so it goes, with ups and downs. There is Christmas entertainment (Connor is roped in to give a puppet show), and a sleigh race, and some nasty stratagems to lure the men of the temperance society to drink, and a young man fighting his demons and losing, but other men coming to the Lord, and a turning point, I suppose, when bar owner Slavin is shown the consequences of his actions. There is also a romance, and some agonizing over "two calls" -- claims on the attention of both Mr. Craig and Mrs. Mavor. And in the end, as we might expect, triumph, if triumph shaded a bit by some sadness, and some growth for the likes of Connor and Graeme. All this seems both sentimental, and moralizing, and that's all true. But it's still pretty effective, and moving at times. Part of this is two central characters who seem basically good but only half in with Craig -- the narrator, Ralph Connor, and the somewhat tormented (by a never explained issue dating to his first career as a lawyer) Leslie Graeme -- both are well depicted and believable. Part is that the writing, if not brilliant, is not bad. Mr. Craig and Mrs. Mavor are both a bit too much the paragon, but they are still likable to read about. And the Western landscape, and atmosphere, are nicely and believably depicted. Probably not a book that will ever again have wide readership (though I believe it's still available in a POD edition), but a book whose past popularity does not surprise. 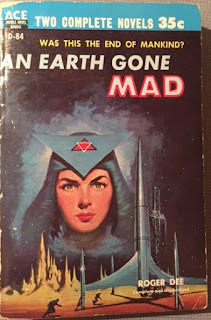 I would have said this novel was completely, not just mostly, forgotten, despite being by one of SF's Grand Masters, but a recent event has changed that slightly: it is a nominee for the Retro-Hugo for Best Novel to be given at this year's Worldcon. I happened across a copy of the 1964 Lancer paperback, its first book publication, at a popup used stuff shop. I thought it a curiosity, and bought it for a dollar. Then I looked at the Retro Hugo nomination list, and was surprised to see it there. 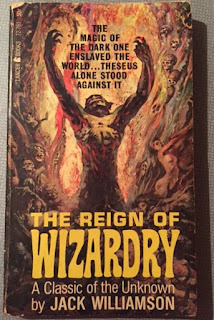 Further research showed that while it languished for a long time before finding book publication, and even then was published by a pretty bottom end paperback house, it's been reasonably well-treated since then, going through several Lancer reprintings, and a nice 1979 hardcover edition from small press Phantasia Press. It's currently available from Gateway/Orion in ebook form. So I suppose not so forgotten as all that. Well, what about The Reign of Wizardry? It turns out to be a retelling of the story of Theseus, and of the Minotaur, though very much altered. It opens with Theseus as a pirate, called Captain Firebrand. His goal is to get to Crete and overthrow the evil wizards who rule Crete, and who also keep other states in the Mediterranean under Crete's thumb, forced to pay tribute and contribute slaves. They encounter a Cretan ship and capture it, and Theseus decides to head to Crete, against the advice of his chief sidekick, Cyron. He also captures a small-time wizard, Snish, who has the power of changing his own or anyone else's shape, though a strong touch (or especially a kiss) will return one to his own shape. Snith was originally Cyron's reward, in the form of a beautiful woman, but when revealed to be a fat little Babylonian, Cyron gladly cedes him to Theseus. After an encounter with the Cretan navy, and its weak admiral, Snish and Theseus end up shipwrecked, with Theseus disguised as a Norseman. He escapes Talos, the robot guardian of the island, who is looking for the pirate Captain Firebrand. But Theseus' plan is to to be captured and sent to the Games, where if anyone wins they take over the kingdom from evil Minos, who has survived such challenges for a thousand years. The other prize is the hand of Minos' daughter Ariadne, the beautiful but (it seems) evil incarnation of the goddess Cybele. Besides Minos and Cybele, the evil wizard Daedalus is the main threat. Theseus witnesses Ariadne's lack of care for her subjects when she carelessly runs over a little child in her chariot, and he gains her attention in protesting this. This leads -- as he had planned -- to his capture, and then to his implausible victory in the Games -- though perhaps he won a bit too easily? And, of course, once Ariadne, now his betrothed, kisses him, his true identity as a wanted pirate will be revealed and he will be thrown into the maze of the Minotaur. And so it goes, but Theseus has resources, including the unexpected help of Ariadne (though not with a spool of thread!). Well, I can't go on -- it continues rather randomly, with the fraught navigation of the maze, a surprising revelation about the true nature of the minotaur, some back and forth with Ariadne, more revelations about her identity, and that of her father, mother, and Daedalus. Oh, and a peoples' revolution. I found it too silly and slapdash to tolerate. The action is never believable -- things are generally too easy for Theseus. Snish is sometimes an enjoyable enough slimy sidekick, I suppose. Ariadne, as combined love interest/villainess, is never plausible. Minos is quite strangely portrayed, to no good result, really. A very weak novel, I thought.